Can I go one month without talking about Tatcha at least once? If you follow me on my various social media platforms (Instagram! Twitter! Facebook!) you'll know I simply don't have it in me. But that's okay. This blog is a diary of pretty things, and pretty things shall be spoken of! Tatcha's newest pretties are part of the Indigo Skincare Collection, which marks Vicky's first foray into body care (huzzah!). Firstly, though it shows my lack of education, I never knew "indigo" was ever more than the name of a color. How pleasantly surprised I was to find that it was also a flower, and an extremely vibrant one at that. It makes me want to bring the plant to various deli owners in New York City as explanation of why it's not okay to dye flowers into unnatural hues. I have a funny story to illustrate how good these products are. My boyfriend and I have been using Haus of Gloi Pumpkin Butter to alleviate our dry skin woes with much satisfaction for the past two winters. 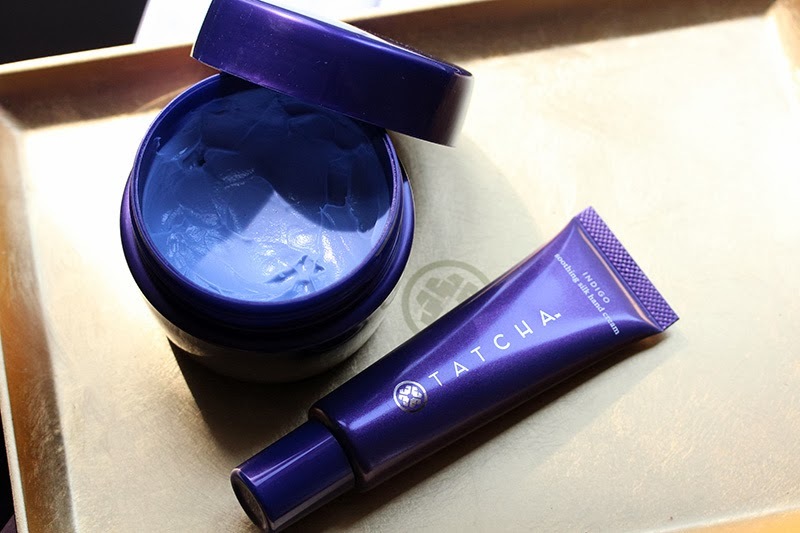 Then I received the Tatcha Soothing Silk Body Butter and hastened to test it because Vicky Tsai is like my fairy godmother of miraculous skincare. The blue cream literally seeps into your skin as soon as you apply it. There is credence to its name, because it really does soothe the skin upon touch. My nose is not discerning, so I can't really tell you what it smells like, but I can assure you that it's wonderful. Back to the actual funny: my boyfriend is as most boys are – ambivalent about his grooming routine (though particularly attached to Dove Beauty Bar. He has a stockpile of it in his bathroom closet). He started moisturizing when we started dating because I was concerned about the cracked skin on his knuckles, but was largely unconcerned which moisturizer we used. When I was testing the Tatcha butter, I also applied it on him, and since then, he asks me if we can "use the nice stuff." 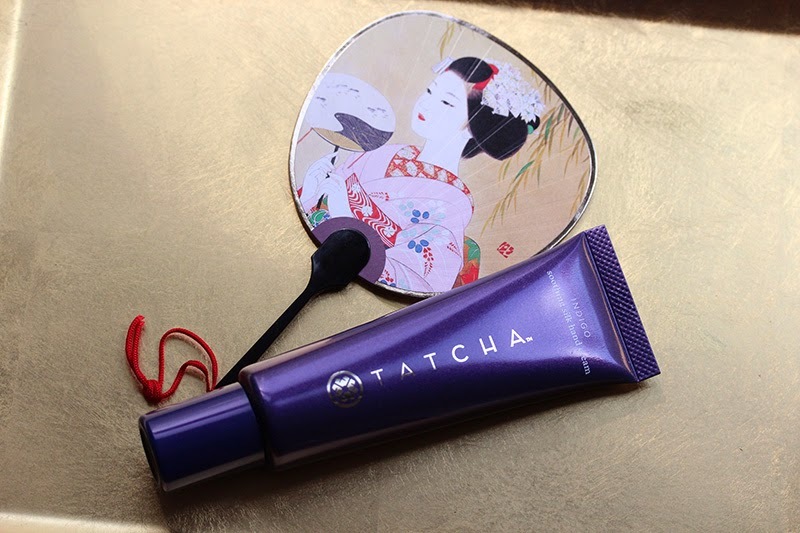 The Tatcha Soothing Silk Hand Cream, by the way, is basically the body butter in portable form. One of the many reasons I love the brand is because of its commitment to quality and craft. Each Tatcha product is packaged exquisitely and with care, and while that is the norm in Japan, you rarely see it in companies based in the US, even those with Japanese roots. I've also been lucky to receive one of the brand's signature gifts last Christmas, namely the Obon Tray featured in the pictures above. It adds a touch of glamour to my nightstand and makes my cluster of candles look much more organized. Tatcha Soothing Silk Body Butter retails for $48 and the Soothing Silk Hand Cream goes for $38. Available at tatcha.com and select Barney's locations.